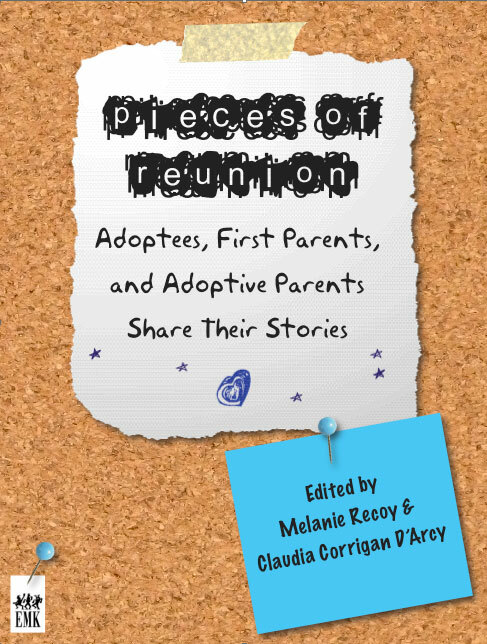 This entry was posted in adoptee, adoption, adoption reunion, Adoption reunion book, adoptive parents, Carrie Kitze, Claudia Corrigan D'Arcy, EMK Press, parents, Pieces Of Reunion, Uncategorized and tagged adoptee, adoption, adoption issues, Adoption reunion book, adult adoptee, EMK Press, melanie recoy, Pieces Of Reunion. Bookmark the permalink. I won’t be much help here, but I am at least going to link to this on Sunday. I am THRILLED y’all are doing this and can’t wait to chat with Claudia about this when I’m in New York in August. I assume that if I want to submit something, I do it by e-mailing the EMK staff address as listed on their website and not to you or Claudia’s personal e-mails? Oh geez, I just read the document properly and it told me where to send my submission to. XD Sorry, Addie. Just found you 🙂 Will submit my story! Id like to submit something as well, if I may. I havent been blogging about it largely because Im afraid certain parties will find it on line…yes, Im a coward…but I am like you – once the reunion went underway, I found myself adrift and unable to find a “go-to” spot where I could get some perspective as an adoptee. Couple this with trying to explain myself to both parties, and you have someone who feels extremely split and fractured. Speaking for myself ONLY, I am not certain that writing it all out online was going to get me anywhere except deeper in a hole of confusion. Thats why I ultimately shut down the blog that I did have. That and certain non-adopted parties persuaded me to let them see some very personal entries and then proceeded to use it to destroy a friendship. That person betrayed me on several levels, and I have learned a lesson. What do I do and where shall I send my story? Never mind, stupid me didnt make it all the way to the bottom of the post – will endeavor to submit my own story! The closing date for submissions was Oct. 1. I sent two articles but haven’t heard anything back at all. I hope that is because you’re totally swamped reading great stories! Only just found this so too late.Assume you have read Evelyn Robinson on reunion?